The Road to Winterfell #24. When is "attacking alone" checked? Short answer: At the time the reaction/interrupt is triggered. Lady Sansa's Rose checks "After you win a challenge in which ... is attacking alone". 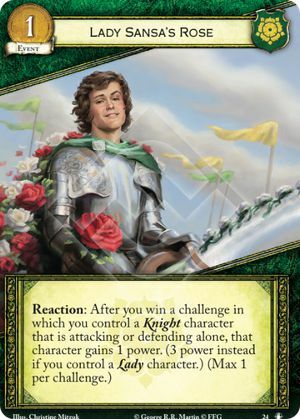 The present tense indicates that you are checking at the time of triggering, and whether the challenge was declared with more attackers, or resolved with more attackers (that were removed, say, due to Highgarden or Like Warm Rain doesn't matter - the only limitation is that the character in question be the only attacking character at the time the reaction is initiated. A particularly neat trick here is to use The Hound (Westeros), whose Forced Reaction will drive him back to your hand before any reactions to winning a challenge occur. This will enable the now-lone Knight to be attacking alone when it is relevant.